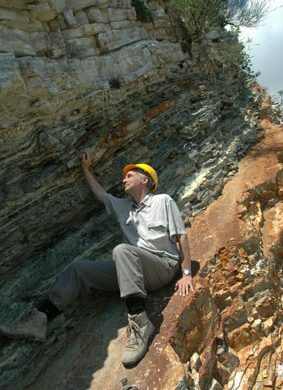 Hugh Jenkyns has been elected a Foreign Member of the Academia Nazionale dei Lincei in the Class of Physical, Mathematical and Natural Sciences, Category IV – Geosciences. Founded in 1603, and headquartered in Rome, the Academy is the oldest scientific society in the world and numbers Galileo Galilei amongst its earliest members. As of 2017, the Academy comprised 525 members, of whom 191 were Ordinary Italian Members, 170 were Foreign Members, and 164 were Italian Corresponding Members. Other Oxford Members include Sir Roger Penrose (Maths), Christopher Wickham (Hisory) and Tim Palmer (Physics). This further recognition of his geological research in Italy follows on his election as a Foreign Member of the Milan-based Istituto Lombardo Accademia di Scienze e Lettere in 2015. More details on the Lincean Academy can be found online on their website and via Wikipedia.